Carryings On Up The Dale: This week’s game. 1672 and all that. 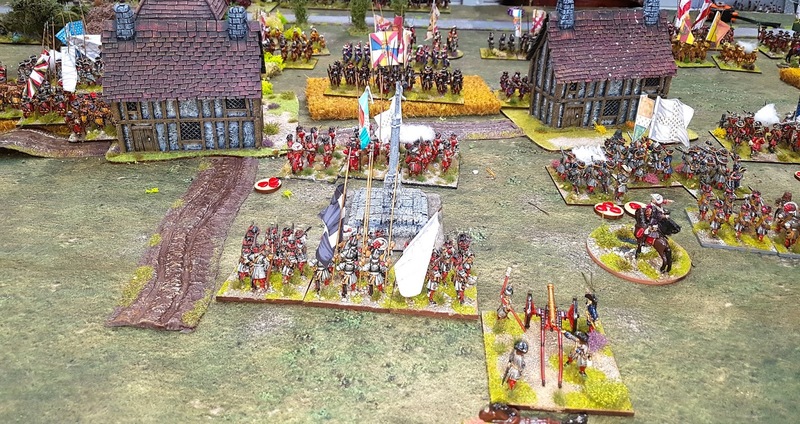 This week’s game. 1672 and all that. 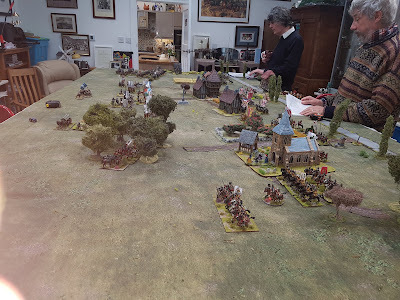 Wednesday saw another gathering in The Burrow for a 1672 Franco-Dutch War game, but this time to play test Paul Stephenson’s new set of rules, “The Panoply of War”. The rules are a generic written and developed by Paul covering everything (I think) from the Pike and Shot era through to the mid/late 19th century. Paul will also be putting something on Youtube once the rules are "live" which should be interesting. 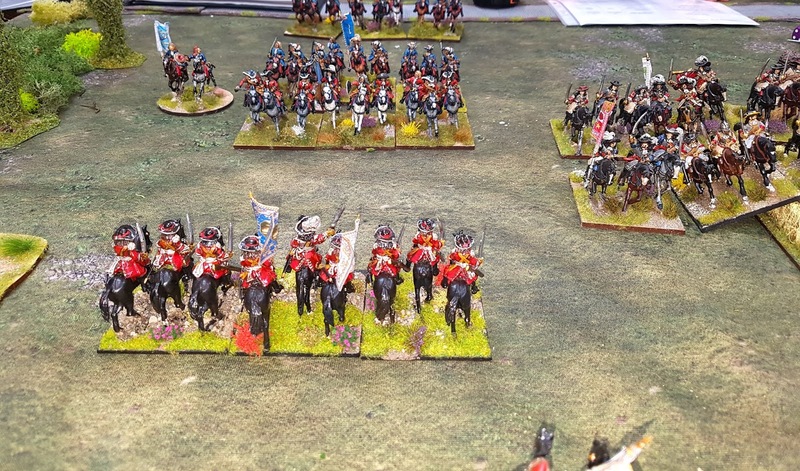 I organised two sides, roughly the same in size and quality, 'ish; more horse and artillery on the Allied side, more and slightly better foot on the French. Paul was here to keep us on the right track, ‘us’ being yours truly and Conrad. I took the French and Conrad the combined Dutch/Spanish/Imperial force. The game started with us each deploying a brigade at a time. 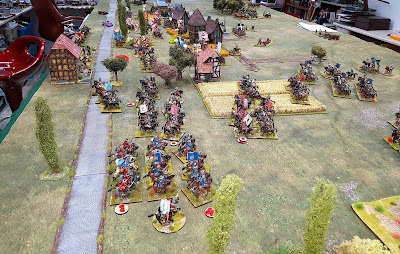 After this there was a 'fun' phase where it was possible to disrupt the opponent's deployment i.e. actually move enemy units out of formation. This had the effect of the original nice orderly lines being somewhat fragmented. The Allies suffered the worst of this with their cavalry formations on both flanks jostled around a fair bit with units being moved out of position. There were four objective markers on the table, which we took turns to place, in the shape of two roadside shrines, a big cross and a group of civilians in the church. This is the battlefield after the deployment disruption phase. As can be seen the French on the right were able to maintain reasonable order. My plan was simple. 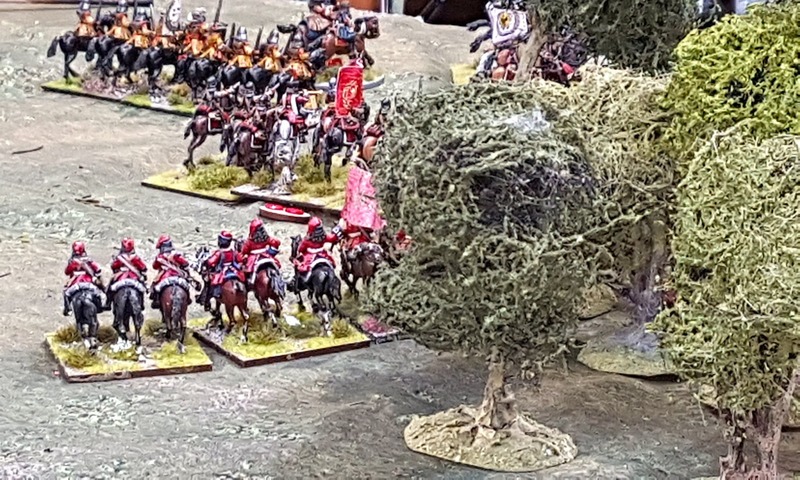 Both my dragoon regiments were dismounted in the woods anchoring my right in the far distance. 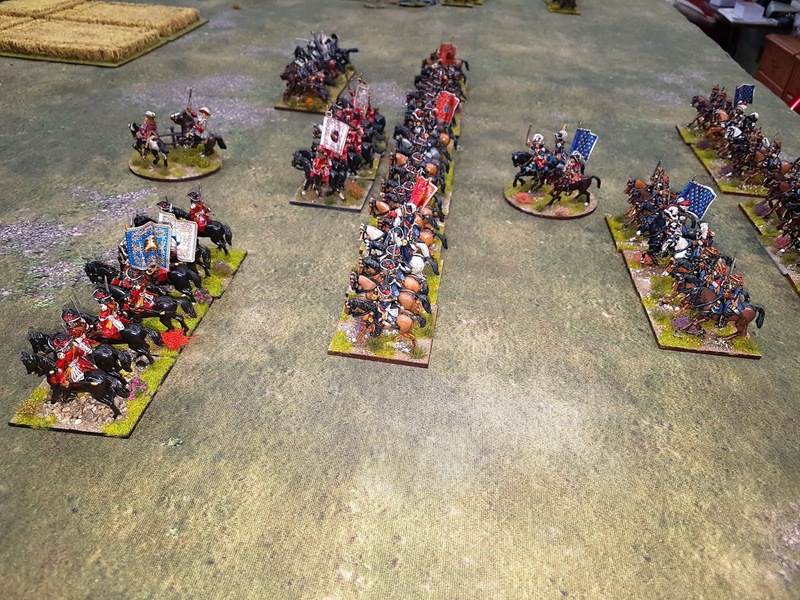 All my horse were on my left, with the infantry massed in the centre to punch through the Allied line. 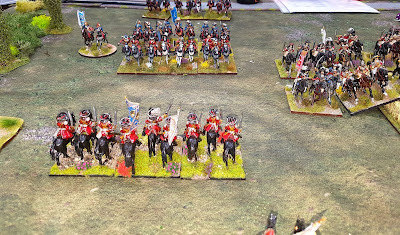 Conrad put his Imperial cuirassiers on his left flank and his remaining Dutch horse facing my cavalry. 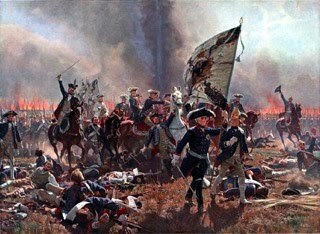 The Allied foot held the centre while his artillery were somewhat exposed between the infantry and his right wing. The deployment from the other end of the table, showing the Imperial cuirassiers on the Allied left. The French left wing. Six squadrons of the Maison du Roi backed up by three of the Cuirassiers du Roi. Facing the French horse were three squadrons of Dutch Horseguards and Lifeguards and four squadrons of Dutch horse. The church as seen from the French right. 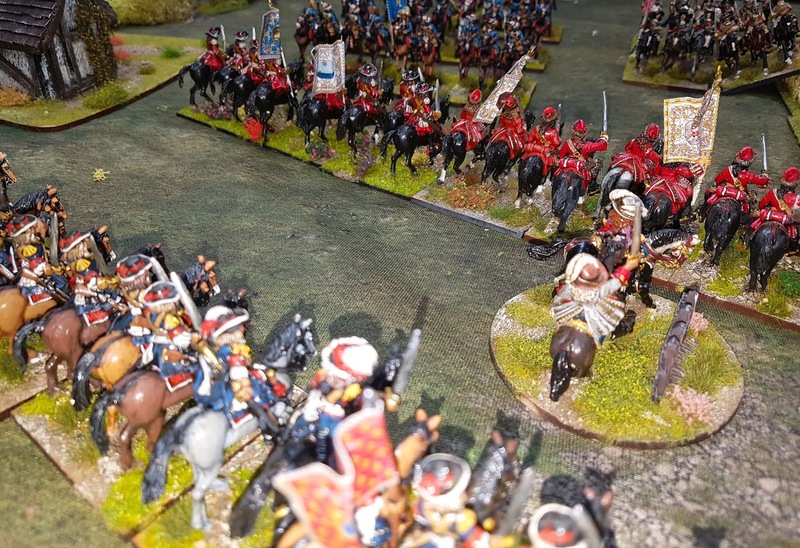 The Imperial cuirassiers were slow to get moving and their deployment on the extreme flank effectively left them out of the battle. 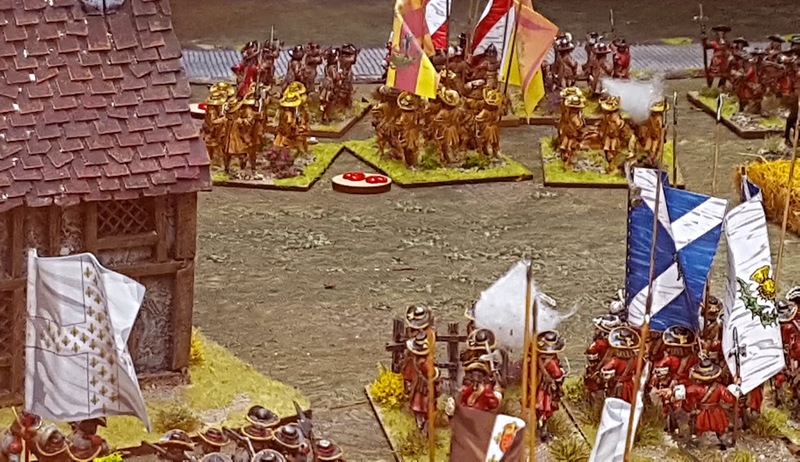 I had planned on them taking far too long to influence the game if they went around the wood rather than in front of it. Thankfully, they went tried to go around it. 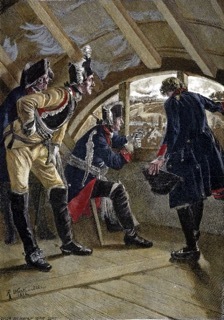 The Gendarmes de France (front left) charged the Dutch Horseguards and drove the first and second squadrons back. 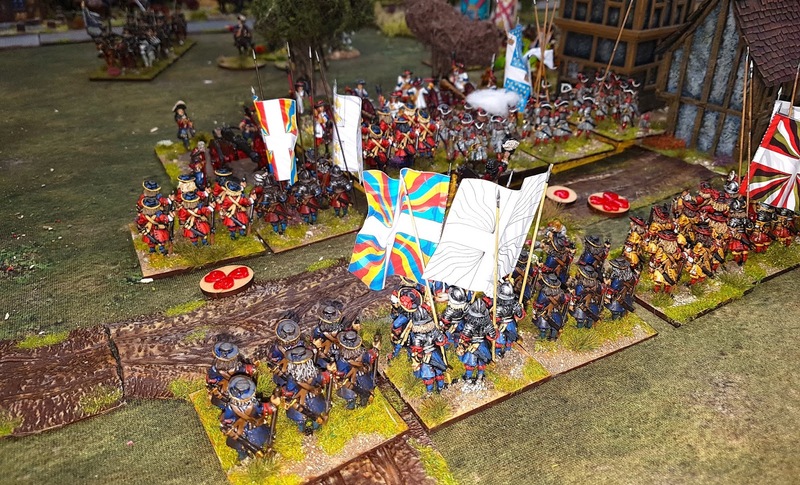 The victorious Gendarmes were in turn pushed back by the Dutch Lifguards. 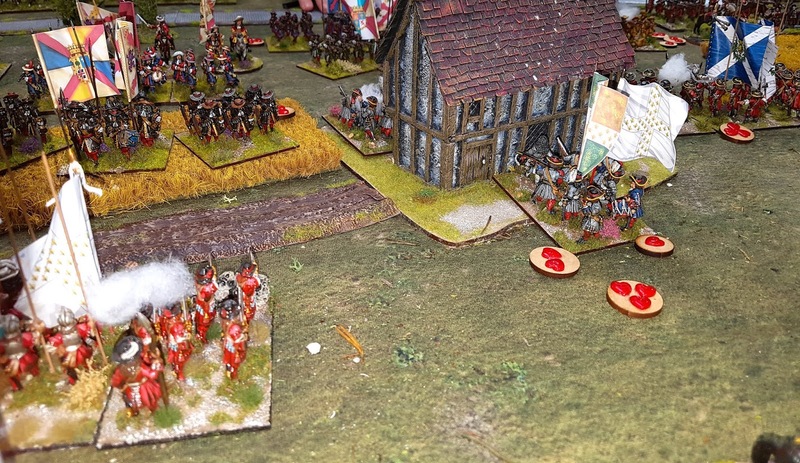 In the centre there was no messing about as the Gardes Francais and Suisse advanced towards the artillery. 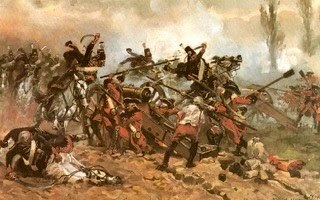 They took heavy losses from the guns and from Spanish dragoons in the houses on their flank but shook them off and stormed the battery, driving the gunners off and capturing the cannon (below). 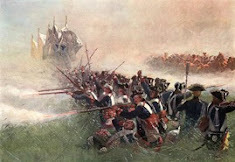 In the centre the Fusiliers du Roi launched three attacks on the Spanish holding this hamlet. 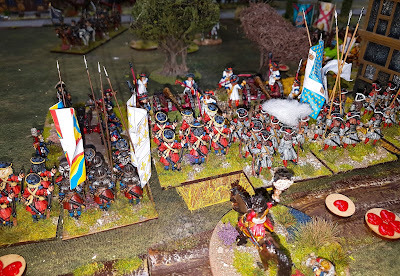 Despite heavy losses they finally prevailed and forced the defenders out. 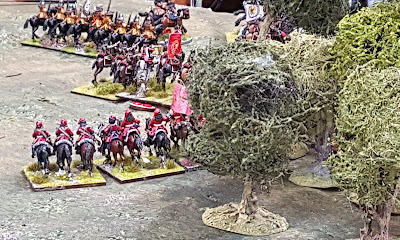 Way over on the right wing the Imperial cuirassiers were slowly circumnavigating the wood while being peppered with musketry from my dragoons lurking in the woods. Back in the centre my attack continued. Dumbarton's Regiment charged a battalion of German infantry, who broke and fled, taking with them another battalion to their rear. 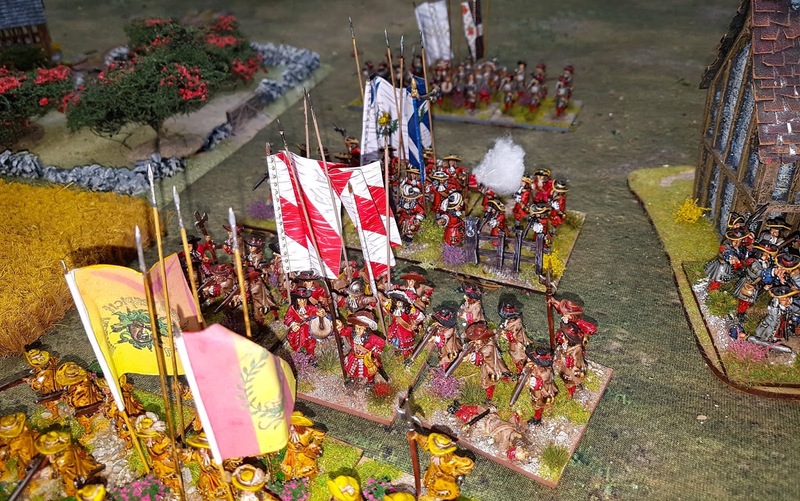 Royal Roussillon (in red) were also heavily engaged against the Spanish. The Spanish dragoons holding the farm on the left had been forced to retreat and the battalion in the building on the right was shorted to be evicted by the Fusiliers du Roi, as can be seen below. The cavalry melee continued throughout the game, and a massive, exciting and frustrating whirlwind of a melee it was too. In the end the French had pushed the Dutch cavalry back, breaking two squadrons and leaving many of the others in disarray. 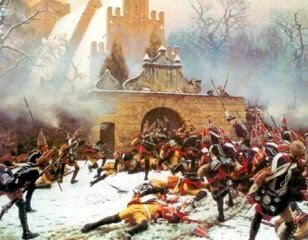 The French Grenadiers a Cheval had lost 50% of its strength, while the Musketeers of the Guard and Gendarmes de France had also lost heavily. 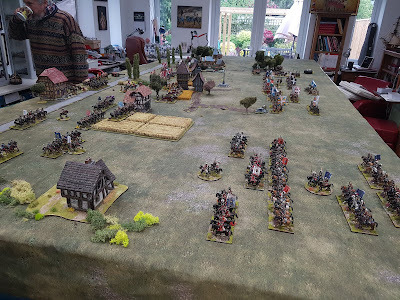 Conrad's outnumber horse did well in slowing down the execution of my plan to sweep the enemy from the field with the Maison du Roi while the Cuirassiers du Roi plunged into the gap now the French artillery was overrun to roll up the Allied centre. It never happened of course. 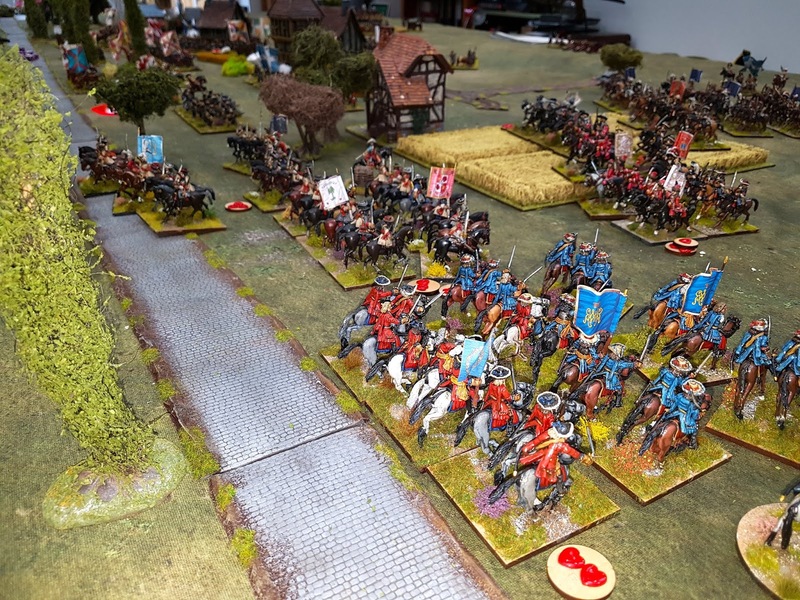 The Dutch Horseguards reforming to face another onslaught by the French. In the centre the German and Spanish brigades were starting to crumble. 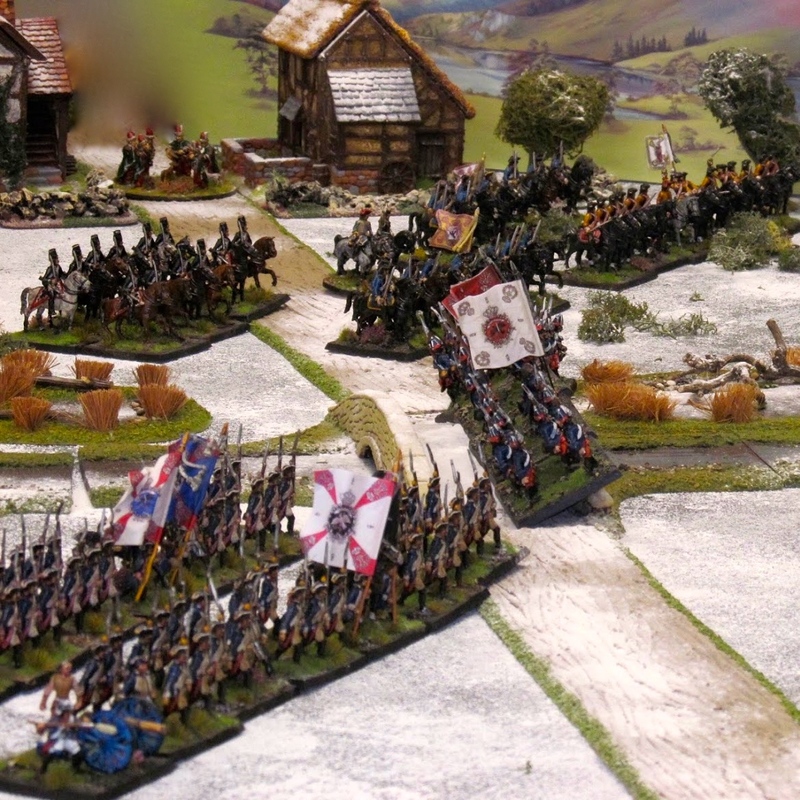 Dumbarton's Regiment in hot pursuit. At this post Conrad conceded defeat. I have to say I was quite surprised to have snatched this victory as I was running against the clock. 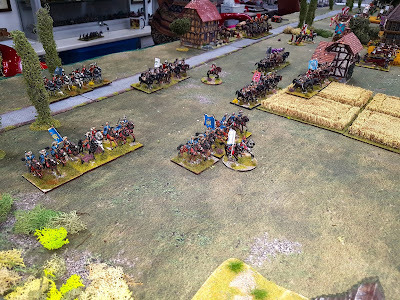 If the Imperial cuirassiers had been quicker they could have taken my guns and attacked my centre from the rear before my headlong assault had time to work. I warmed to the rules quickly. The set up stage was maybe a bit unnecessary and time consuming but it actually worked rather well I think. 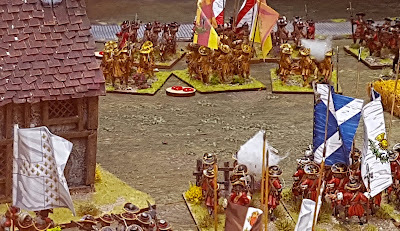 The rules appear, from this game at least, to favour an aggressive player, which suits me, and we were able to make the oddities/characteristics of 1670's armies fit in with the rules quite well. More tinkering required re troop types I think, and I shall do this before the next game. A very enjoyable game and I look forward to another one soon. Next Game is Monday 4 June. 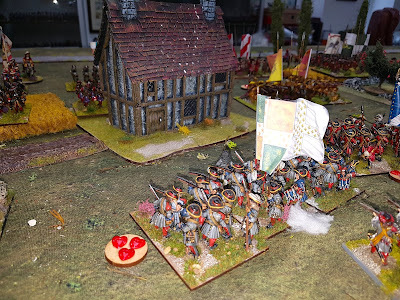 What could be the climax of my French Revolution mini campaign. 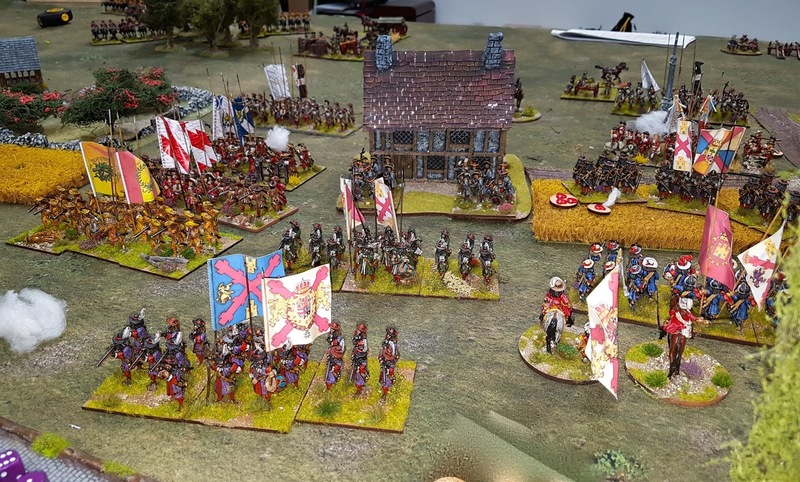 A wonderful looking game in a fantastic period! Another lovely looking game Colin! Glad to see you enjoying varied colourful games in your new Burrow, and winning too! 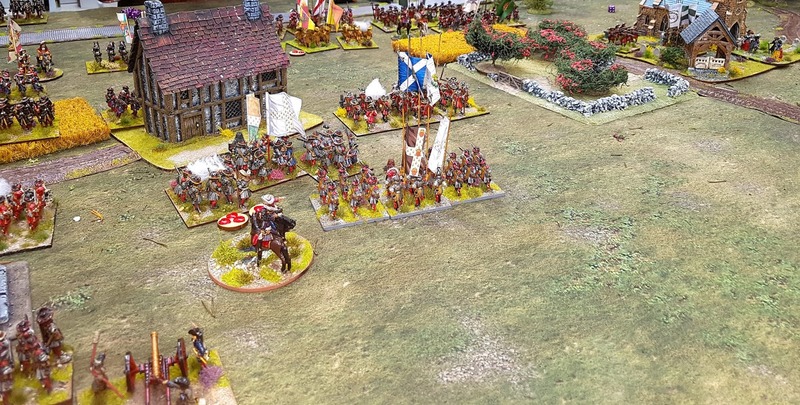 What a great looking game Colin, beautiful figures and scenery, all well presented through excellent photography! A fine looking game Colin. 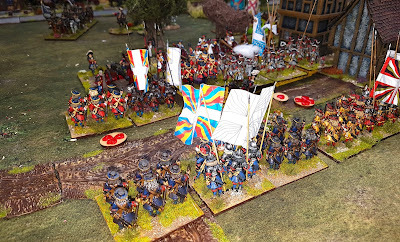 The AAR and pictures take the reader right into the action. Another fine AAR with the usual great eye candy. Thanks! Very fine and a great temptation.